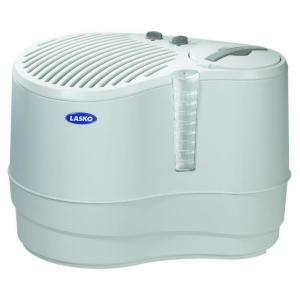 Lasko 9-Gallon High Performance Recirculating Humidifier PPPA, Avi Depot=Much More Value For Your Money! The 9-gallon Recirculating Humidifier offers contemporary styling and efficient humidification up to 3,200 square feet, making it ideal for multiple rooms and large living areas. The patented, cascading waterfall shows the unit is working and the removable clear water reservoir with dual handles allows for easy filling. Castors on the bottom of the unit allow for mobility on any surface. Evaporative filter pad (Model THF 8) is included making this unit ready to operate right out of the box.